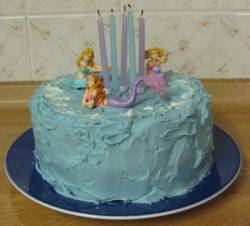 You have just found all the best Under The Sea Party Ideas on the web! Now you can join Ariel and her friends for a fab party. If you prefer however all these party ideas can be simply adapted to work for Finding Nemo or any other underwater theme. There are plenty of sites on the internet where you will find pictures of the characters from the film. These could be easily downloaded and incorporated into your invitations. So how about fish shaped invites. Colour and cut them out. Add the party details to the back. Octopus, seahorse, mermaid and jellyfish would also all make great cut outs. Outside use fish as arrows to point the way to the party. Inside colours should be blues and greens. 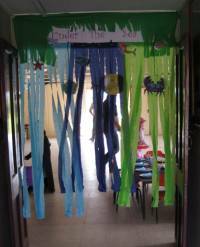 Decorate doorways with strings of shells and strips of green and blue tissue, string and material to form hanging curtains of "seaweed' that are the entrances to "watery caverns". To these add the things you can easily make yourself. As usual this can be half the fun of preparing for the party and an excuse to spend quality time with your kids. Its easy to paint fish, octopus, lobsters, seahorses, mermaids or any other nautical wonders that take your fancy on to paper or card. Cut them out or use as posters on the wall. You can also tie cotton thread to them and make hanging fish decorations that you can attach to the ceilings and doorways. Cover card fish cut outs with cooking foil to make silvery shoals. Kid's handprints with faces added make cute octopuses. Mermaid outfits like Ariel for girls are always popular and floaty net dresses in blue and green hit the mark. Add strings of shells and pearls. Dressing up tiaras and crowns will transform any young girl into a beautiful sea-princess. Boys may prefer to come in diver's masks and snorkels or simply stamp or paint a fish / crab design onto an old shirt. Paint or download from the internet 6 different pictures of either characters from the film or general sea creatures such as: lobster, mermaid, shark, seahorse, octopus, starfish. The pictures should be about A4 size(30x21cms) and you need 2 sets of each design. You may like to laminate one set of these or stick them on to card. When the music starts everyone stands in the middle doing their own special underwater dances how about the "Seahorse Shuffle, The Tuna Twist or The Lobster Lambada!" When the music stops they have to "swim" over and choose one of the pictures to stand by. One card from the other pile is then chosen at random and all the kids who chose that picture ie all the starfish win a small sweet (a jelly fish or pink candy shrimp would be good). Then everyone is back in the middle to do it all again. It sounds simple but kids love this game and it makes a great way to start your party. Also everyone is involved all the time and no-one is out. Some kids will win several times but if at the end there is anyone who has not been lucky make sure they get a sweet! 4 A4 (30x21cms)copies of a picture of a sea-turtle. Either stick your pictures onto strong card, thin board or laminate them. Punch a whole at the front end of your turtles and tie a small loop of string or ribbon. 2 islands- These can be drawn on card, made of material or simply be an old doormat or bit of carpet. Your islands should be just too small to hold half your party guests! Split your kids into 2 teams each with 2 turtles. The islands are placed at the other end of the room. Each child in turn makes their way to their team island standing only on the turtles. They have to reach down and move a turtle forward jump onto it and then reach down and move the next jump again being sure they don't step in the shark infested waters. When they reach the island they jump ashore and an adult helper takes the turtles back for the next child. One by one the entire team arrive at the island which is getting filled up with kids who are all having to hang on to each other to avoid falling into the sea. By the time the last child reaches they should just be enough room for one more...........! Some paper fish A4(30X21cms)size approx. These can be out of any light paper including newspaper. 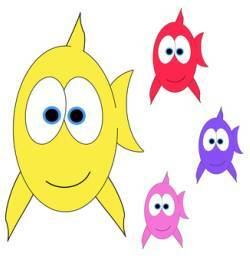 Another option is to give every child a plain printed fish to colour in and name when they first arrive. The kids are split into teams and lined up at one end of the room. In turn they need to use a newspaper to flap their fish to the other end of the room. You will find that some kids really get the hang of this and can flap their fish easily. Others may struggle so have adult helpers to hand. Rather than flapping with a newspaper you can also use balloon pumps, the air from balloons themselves or even those small handheld mini-fans to waft your fish to the finish line. Ok we are mixing our films a bit but who is going to notice! You could always substitute the crab Sebastian for Nemo if you wanted. A small plastic clown fish (Nemo) or several if you are feeling flash! You can buy these as toys in many stores. If not paint any toy fish orange and white or cut one out of coloured card. The children are taken where they cannot see what is going on and Nemo is hidden somewhere around the room. When they come in they have to find Nemo. If you have been imaginative with your hiding it can take a couple of minutes. If it appears that Nemo is too well hidden you could try an Under The Sea variation on "getting warmer / colder" by shouting "getting wetter / drier"
Tie the strips of material around the children's ankles. They then have to squat down in and put their hands through the material loops. They are not allowed to take their hands out of these loops but best not to tie them in case of accidents. This will then mean they can only scuttle about like crabs. Simple relay races to the end of the seabed and back. Make it more difficult by putting lobster pot obstacles (decorated cardboard boxes) to be scuttled around. Tides going out - this works well if you have enough room. Line your crabs up in a line all facing you. Then you say "The tide is going out!" and all the crabs need to get to the other end of your course as quickly as possible. This is quite funny to watch as some are bound to topple over. You could also do a variation of musical chairs. When the music stops the crabs all have to find a rock (cushion) to sit on. A couple of poles with 6 - 10 strings tied to them. Some ring do-nuts to which you have loosely attached a plastic cable tie this is better than string as it doesn't cut through the dough-nut so easily. Have 2 adults hold the poles on their shoulders with the end of the strings at child height. Attach a dough-nut to each string. The children are told that these are fishing lines and the anglers are trying out a new bait -"Dough-nuts". Are they clever enough to nibble the dough-nut off the string with out getting caught. If they use their hands the fishermen will notice and catch them!